Recipe of the Day: Candied Sweet Potatoes, Buffalo Wings, & Broccoli w/ Cheddar. 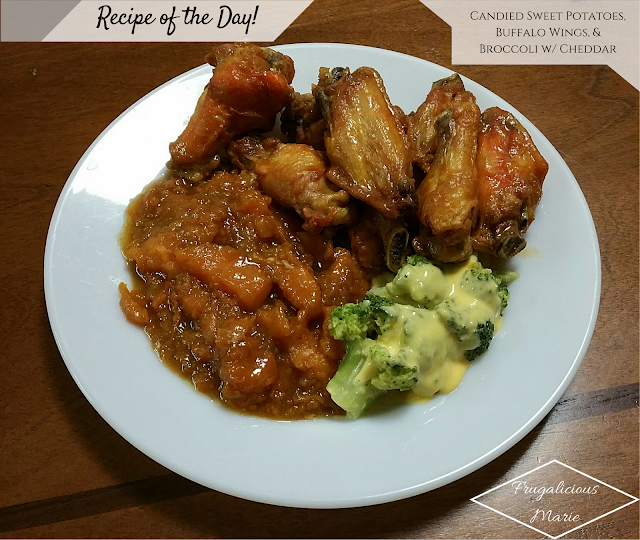 I have been slacking lately on posting the Recipe of the day but I am back! Last week I made a dish that was delicious! This was my first time making candied sweet potatoes so I went into this thinking it would come out too sweet. Thank goodness my mother helped me along the way. This side dish will easily serve around 12-15 people. I will post all of the recipes separate down below. You are more than welcomed to play around with the candied sweet potatoes recipe. This recipe has been in my family for years. 4 pounds or 8 sweet potatoes peeled and cut into quarters. Add potatoes and boil until slightly underdone, this should take about 10-15 minutes depending if you have a gas or electric stove. In a large saucepan over medium heat, combine butter, brown sugar, 2 cups marshmallows, cinnamon and nutmeg. Cook, stirring occasionally, until marshmallows are melted. Add potatoes into marshmallow sauce and gently stir. While stirring, mash about half of the potatoes while leaving some bite chunks. Remove and cover top evenly with remaining marshmallows. Return to oven and bake until marshmallows are golden brown. Season the wings with salt & pepper to taste, set aside. Start working on the buffalo sauce. Stir with the whisk, and set aside..
Fry wings in deep fryer until crisp. Remove and place wings in a big mixing bowl. While the wings are hot, pour buffalo sauce and mix. Melt the butter in a small saucepan; remove from heat. Blend in the flour until smooth using a wire whisk. Return to heat; gradually whisk in the half and half cream; bring to a light boil, keep whisking until the mixture is smooth. Add in the cubed Velveeta and shredded cheddar and continue to mix with a spoon until cheese is melted. Add in the salt and pepper; mix until combined. Steam broccoli in microwave or on stove top. Pour over the veggies JUST prior to serving. I hope all of you enjoy these recipes! If you tried them, let me know and comment below!